Right-wing media have been smearing Democratic presidential candidate Sen. Bernie Sanders (I-VT), who identifies himself as a democratic socialist, by comparing his ideology to that of Adolf Hitler and his National Socialist German Workers' (Nazi) Party. Experts have called the comparison "inaccurate," "outrageous," and "a trivialization of history." Right-wing media personalities have incessantly attacked President Obama's six previous State of the Union addresses -- from calling the speeches "boring" to questioning his decision to invite a wounded veteran to the event -- and have even frequently waged the attacks before the addresses even occurred. Ahead of Obama's January 12 State of the Union address, Media Matters looks back at conservative media's long history of attacking annual addresses. 2010: Get Ready For A "Big Propaganda Speech." Before President Obama made his first official State of the Union address on January 27, 2010, right-wing media pundits called the speech "stupid" "propaganda." Fox host Sean Hannity repeatedly referred to the upcoming speech as "propaganda," and former Fox host Glenn Beck told his viewers "you don't even have to watch this stupid speech tonight. I'll watch it for you so you don't have to." Beck added, "I want to hang myself over watching this." Fox Business' John Stossel asked Obama to use the address to apologize for being "arrogant." After his speech, media personalities criticized Obama, and claimed he didn't show enough humility. Stossel said Obama "certainly didn't sound humbled," and only a few minutes into the address, National Review's John Hood criticized Obama's "cadence and rhythm" for coming "across as flippant and arrogant." The talking point wasn't anything new -- frequent Fox guest Ben Stein had predicted that "we'll see Obama with his fake modesty and his fake humility" before the speech took place. Once again, Glenn Beck joined the chorus: "the arrogance from the moment this guy walked in, the arrogance -- there's no humility there." 2011: Obama Will "Lie For An Hour And Fifteen Minutes." President Obama made his second State of the Union address on January 25, 2011, and the media predicted it would focus on theatrics instead of substance. Rush Limbaugh directed his listeners to watch a Golf Channel show he appeared in instead of the address, predicting that Obama would "lie for an hour and fifteen minutes." On Fox News' Fox & Friends, co-host Brian Kilmeade questioned whether Obama would be sincere, suggesting that the president was merely trying "to make sure he gets re-elected." After the speech, Limbaugh continued to attack Obama's sincerity, saying Obama "just doesn't believe" the "pro-America rah-rah" featured in the speech and suggesting that the speech was plagiarized. Fox & Friends' recap of the debate called the speech "boring." 2012: Obama's Speech Helped "Kick Off His Class Warfare Campaign" That "Declared War On Success." Continuing their tradition of attacking Obama prior to the address, Fox News hosts criticized the focus on economic security and income equality. On Fox & Friends Kilmeade said that Obama would "bring up the class warfare stuff," while co-host Steve Doocy forcasted that it would "ignite the whole class warfare thing." Co-host of Fox's The Five , Andrea Tantaros predicted the address would be a "very divisive, very evil speech" that is "designed to get people in the audience who are sitting home on their duffs ... angry at their neighbors who are actually going out, who are working hard." After the address, right-wing media largely continued their "class warfare" narrative. Fox's Doocy doubled down against Obama's focus on income inequality, saying that his comments regarding billionaires paying the same percentage of taxes as their secretaries were intended "to kick off his class warfare campaign." Fox Business' Dave Ramsey even claimed Obama "declared war on success in the name of this class warfare politics." 2013: Obama Gave A "Castro-Like Speech ... Albeit In English." After President Obama's February 12, 2013 State of the Union Speech, right-wing radio host Mark Levin accused Obama of "lying to the American people" in a "Castro-like speech." Levin criticized the economy under Obama claiming he keeps "proposing more programs, more trusts, more partnerships, more agencies, more spending." A Fox Nation headline echoed Levin's comments: "Obama Pleads For Billions In New Deficit Spending." That same post, however, linked to a FoxNews.com article that reported the full transcript of Obama's comments, explaining that his proposals would be "fully paid for" and that "nothing [he's] proposing tonight should increase our deficit by a single dime." 2014: "Does It Matter What The President Says" In His State Of The Union Address? Before the January 28, 2014 State of the Union, Fox News once again downplayed the address, asking, "Does it matter what the president says?" After the address, Rush Limbaugh was critical of Obama's guest, wounded Army Ranger Cory Remsburg's presence. Limbaugh claimed that Obama invited a wounded veteran to the address to say "look what George Bush is responsible for." Right-wing media also pounced on Obama's comments that climate change demands urgent action and that the debate over it is "settled." Their evidence against the claim? Cold weather and snow across the country. 2015: "I Hope He Fails." In the most memorable vitriol from President Obama's January 20, 2015 State of the Union, Rush Limbaugh told his audience he had already written his response before the address: "I hope he fails." Limbaugh then bragged that "that has been my State of the Union response every year. I hope he fails. It is what it is. You can't get more clear cut than that." On his January 21 show, Limbaugh rehashed his reasoning behind boycotting the speech saying that he would have been "insulted as a conservative" and "lied to" and that the address would have been the "next Santa Claus list." Note: this analysis did not include Obama's 2009 Address to Joint Session of Congress. Right-wing media frequently distort climate science in order to dispute the overwhelming consensus that human activities are responsible for climate change. But sometimes scientists fight back and stand up for their work. Here are nine times scientific researchers stood up to deniers who misrepresented their climate studies. Fox Nation Promotes Absurd Conspiracy Theory That EPA "Foul[ed] Up" Animas River "On Purpose"
On August 12, FoxNation.com republished portions of a post by The Gateway Pundit headlined, "Letter to Editor PREDICTED COLORADO EPA SPILL One Week Before Catastrophe So EPA Could Secure Control of Area." Fox Nation highlighted the portion of the Gateway Pundit post in which author Jim Hoft wrote: "The letter detailed verbatim, how EPA officials would foul up the Animas River on purpose in order to secure superfund money. If the Gold King mine was declared a superfund site it would essentially kill future development for the mining industry in the area. The Obama EPA is vehemently opposed to mining and development." Examiner.com also cited the letter in an August 12 post claiming "[e]vidence suggests that the EPA's Animas wastewater spill was purposeful for gaining Superfund money." The conspiratorial letter was also republished in The Wall Street Journal, although The Journal described the spill as an "accident" and only cited the letter to suggest further EPA action "may make the situation worse." After South Carolina Governor Nikki Haley (R-SC) announced that she supported the removal of the Confederate battle flag from the state Capitol, right-wing media figures responded by attacking the flag's possible removal as "cultural cleansing" and asking whether the American flag would be next. Fox News' varied online news platforms characterized Democratic presidential candidate Hillary Clinton's recent remarks on immigration with three very different headlines. In May 5 remarks, Clinton called immigration "a family and economic issue" and expressed support for expanding protections "to help parents of immigrant children stay in the United States." Fox News Latino headlined a story about her remarks as, "Hillary Clinton makes deportation protection, path to citizenship central to campaign." This frame contrasted significantly with that of FoxNews.com and Fox Nation. FoxNews.com referred to "illegal immigrants" in a headline that read, "Clinton calls for path to 'full and equal citizenship' for illegal immigrants." Fox Nation, a site known for trading in racial dog whistles, chose the headline, "Hillary Clinton Vows to Expand Obama Amnesty to More Illegals." Fox News and Fox Latino have a history of portraying the same events through very different lenses. Conservative media are alleging that the Federal Emergency Management Agency (FEMA) is attempting to "punish" governors who do not acknowledge climate change by "holding disaster funds hostage." In reality, FEMA is simply updating its requirements for state disaster mitigation plans to ensure that they include consideration of climate change impacts, which is essential to reduce risk from hazards that states will face as the climate continues to change. Conservative media outlets are broadly attacking clean energy and the environmental movement by falsely alleging that prominent environmental philanthropist Tom Steyer has "deep ties" to the recent scandal involving Cylvia Hayes, the fiancée of former Oregon Governor John Kitzhaber who failed to publicly disclose that she was being paid by a clean energy group while also advising Kitzhaber on clean energy issues. In reality, there is no evidence that Steyer funded Hayes, or that Steyer has any other connection to the scandal. Conservative media revived their Solyndra scandal-mongering to attack the proposed clean energy funding in President Obama's budget. But contrary to their claims, Solyndra did not receive the clean energy tax credits included in the President's budget, and the budget doesn't increase funding for the largely successful loan guarantee program that did support Solyndra. Fox News and other conservative media outlets are attacking gun safety group Coalition to Stop Gun Violence (CSGV) by falsely claiming that the group insulted slain Navy SEAL sniper Chris Kyle. But CSGV did nothing of the sort. The attacks rely on blaming CSGV for statements made by commenters to its public Facebook page. Kyle was a decorated veteran of the Iraq War who was well known for having 160 confirmed kills. In January 2013, Kyle published a book about his experiences, but was murdered just days later at a shooting range by a veteran allegedly suffering from PTSD. Kyle's life story has been turned into a movie, American Sniper. During the January 13 edition of Fox & Friends, host Heather Nauert falsely claimed, "This morning the anti-gun group Coalition to Stop Gun Violence is blasting Kyle, inviting its Facebook users to trash the American hero." On-screen text included "Dishonoring A Hero" and "Anti-Gun Group Trashes Chris Kyle." The January 13 edition of Fox & Friends First similarly claimed CSGV was "trashing Chris Kyle" and "taking swipes at the U.S. military's most lethal sniper," and later displayed a graphic asking, "Should This Group Be Trashing One Of Our Military Heroes Who Defended Our Freedom?" Right-wing media outlets manufactured phony outrage over President Obama's recent remark on ESPN Radio that he usually watches SportsCenter while working out in the morning. In 2007, President Bush similarly admitted to watching ESPN while working. Fox News personalities labeled President Obama's address during the United Nations General Assembly a continuation of his "apology tour," a repeatedly debunked right-wing narrative started during Obama's first year in office. In the spring of 2012, an IRS employee inadvertently leaked an unredacted list of NOM's donors in response to a public records request. The pro-equality group Human Rights Campaign (HRC) got its hands on the list, highlighting past contributions to NOM by prominent conservatives like then-presidential candidate Mitt Romney. Noting that key HRC officials were prominent supporters of President Obama's re-election campaign, NOM alleged a conspiracy between the organization and the Obama administration aimed at embarrassing NOM and its supporters. In April 2012, NOM filed a formal letter of complaint to the IRS. Conservative outlets like The Daily Caller and The Weekly Standard touted the complaint, focusing particularly on the revelation that Romney was one of the group's donors. For most of the next year, however, media interest in the story was scant. That changed in the spring of 2013. In May, U.S. Attorney General Eric holder ordered the FBI to begin a criminal probe into allegations that the agency had targeted tax-exempt conservative political groups. 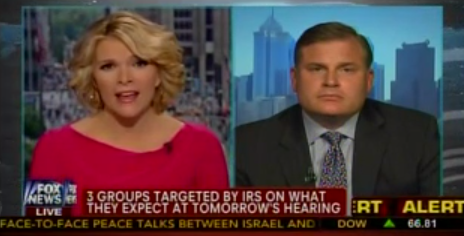 While the IRS actually scrutinized progressive groups more extensively than conservative ones, the IRS "scandal" became a rallying cry for right-wing media. The controversy also meant newfound interest in NOM's allegations against the agency. There's a stark difference in the way Fox News and Fox News Latino covered reports of hundreds of migrant children crossing the U.S. border to flee violence in Central America. Hundreds of migrant children crossing the U.S. border to flee violence in Central America are being held in a makeshift shelter in southern Arizona. The New York Times reported that federal officials predict at least 60,000 unaccompanied minors will attempt to cross into the U.S. by the end of this fiscal year. In Nogales, Arizona, the Department of Homeland Security made available a warehouse to house thousands of children, but according to local media outlets, it has not been without problems. CBS Houston reported that some of the children have complained to the consul of Honduras that the food provided by the shelter is making them sick.